Data visualization is an important step in the data science process. Learn how to use the open source Highcharts library to display your findings. In my previous post, I showed you how to get started with the official Highcharts React wrapper. 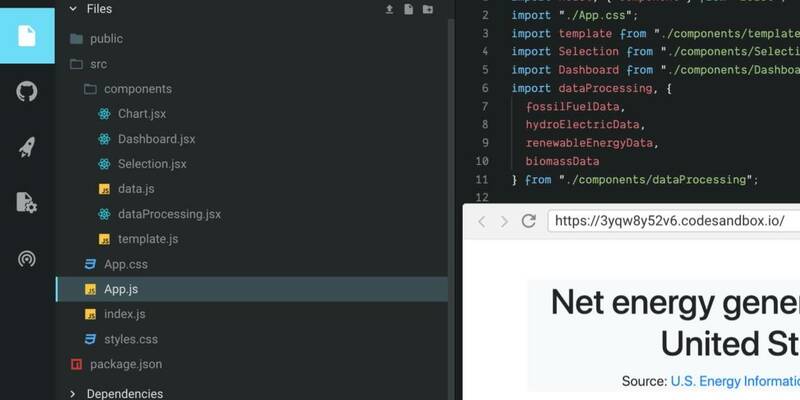 In this tutorial, I will show you how to create a simple, interactive dashboard with Highcharts and the React wrapper. This article is suitable for developers at all levels. It will be a quick read for any experienced developer and provide help for those who are new to either React or Highcharts. I used Create React App and the Visual Studio Code IDE to build this project; you can download the project from this GitHub link or from the Codesandbox. If needed, refer to the previous post for how to create a project from scratch. 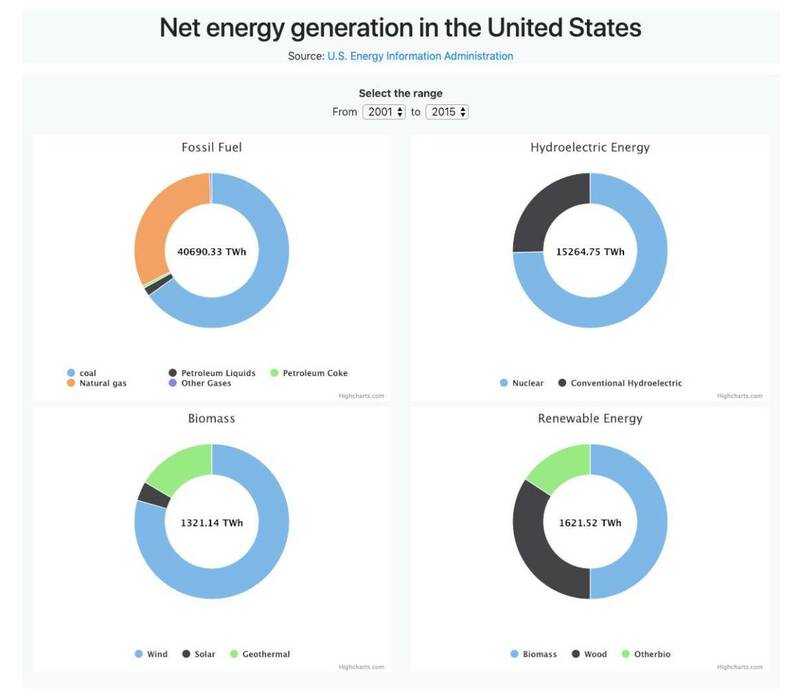 The dashboard below visualizes the net energy generation in the United States from 2001 to 2015. The dashboard allows the viewer to compare the main energy sources produced in the following categories: fossil fuel, hydroelectric energy, biomass, and renewable energy. I collected the data from the U.S. Energy Information Administration also known as EIA. Separate background from the charts (i.e. use color to mark the boundaries of each chart widget). Keep the legend close to the charts. Avoid crowded charts (i.e. break out important information into multiple charts, rather than cramming too much data into one chart). Provide tools to explore data (e.g. zooming and filtering). To learn more about how to create an effective dashboard check the following article 6 Things to Consider Before Putting Charts Into a Dashboard; where you will find more details and demos about each point described above. Let’s go through the process to create the dashboard! Let’s start by reviewing global architecture. Architecture planning helps show what the connections between components will be; it also visualizes the data flow. I strongly recommend taking some time planning your architecture before jumping into the code; you will save yourself a lot of time and frustration. The main idea of this dashboard is relatively simple: a user selects a date range via the UI, this action triggers the process to pull data from this date range, summarizes the data by energy source, then categorizes the result as either fossil fuel, hydroelectric energy, biomass, or renewable energy. The final step is to display the data into four interactive donut charts, one for each category. By the way, donut or pie charts are a great way to show comparisons and compositions at a glance; there are compact and easy to understand, which is why they are so often used for dashboards. Data component: to save the data collected from the EIA website. Data processing: To add up the data after the user selection. 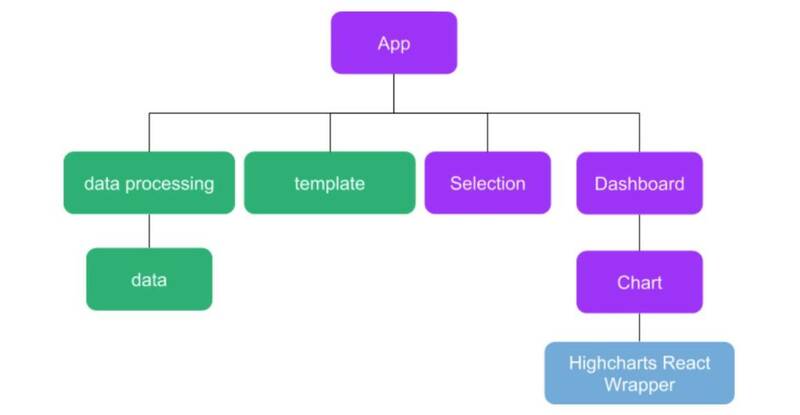 Chart template: To set up the interactive charts’ configurations required by the Highcharts library. Range selection component: To handle the date selectors used by the user. Chart module: To render the charts after each range selected by the user. Dashboard component: To gather and render all the charts on one container. The app component: To gather all the components and run the dashboard. I had to add the Highcharts React Wrapper (blue) to the architecture to visualize and to know where I have to add the library to my project. And since the chart rendering is going to be in the chart component, I imported the Highcharts React Wrapper to that component. After I set up the architecture, I created a new project using Create React App; then I added the folder components where I made a file for each component. To separate the React.js components from the other modules, I started the first letter of each React.js component file with an uppercase; it is a good practice to quickly recognize which file does what since it makes the import intuitive, and reduce any ambiguity among files. This module imports the data from the data module then passes the data with the yearFrom and the yearTo as parameters to an arrow function dataProcessing. The function calculates the amounts of energy produced during the date range for each energy source. The function also handles a message to indicated to the user to select the range, and to be sure that the yearFrom is always smaller or equal to the yearTo. The dashboard has four interactive donut charts, so instead of creating each chart separately, I set up one template module following the Highcharts library structure, then use it in the app module to create the charts. As you can see, the template has the main standard Highchart chart’s configuration such as the tooltip and the plotOptions. This file is a React.js component; it renders the select elements that allow the user to choose the date range. For this component, I use Bootstrap to style the elements, you are free to come up with your own style, but again for the sake of maintainability, I decided to go with a standard styling library. The Chart.js file is another React.js component; it renders the charts each time there is an update. The key element in this component is the componentDidUpdate(prevProps, prevState) method; I use it to check if there is any update before fetching the new charts’ parameters, then passing those parameters to the Char's state component. this.props.data.reduce((accumulator, obj) => accumulator + obj.y,0) / 1000).toFixed(2) + " TWh"
Finally, I gather all the React.js components in this main component, App.js, to render the whole dashboard. The component componentDidUpdate(prevProps, prevState) calls the handleChangeSelect() to process the data (in the data process module), then update the charts. The last step in this entire process is to display the new charts on the dashboard. In the App.js file, I also use Bootstrap to style the different elements that are displayed on the dashboard. Once the project was done, I realized that the most challenging and the most time-consuming part was to figure out the architecture; after that, the code part was straightforward. I also had some challenges with the handleChangeYear; I had to use the bracket notation to be sure that I am handling the right button. Well, that's it. I hope my experience will be helpful for you, and feel free to share your own experience with the wrapper, or leave a comment/question below, I will be happy to answer you.